One look at a satellite image of the Earth at night reveals a lot about energy inequality in the world. Europe, the United States and the Middle East glow with bright lights. Japan is alight, and so are most of Southeast Asia, Southern Canada and the densely populated coastal regions of South America and Australia. But Africa—beyond a blazing Johannesburg and few flickering urban hubs—is dark. According to the International Energy Agency, approximately 1.3 billion people worldwide lack access to electricity. Almost half of them live in small, remote communities spread across sub-Saharan Africa, which is home to nearly one billion people. And in spite of surging economic growth in many African countries, the number of people not connected to modern energy services is rising, because infrastructure expansion is unable to keep pace with urban growth. Indeed, with the high costs and slow growth of energy services, the percentage of Africa’s “connected” population—both urban and rural—has changed little in the past 40 years. That is almost how long Carl Bielenberg has been looking for ways to create affordable power in Africa. In the 1980s, the mechanical engineer was exploring how to use vegetable oils as lower-cost substitutes for diesel fuel, which powered most rural machinery at the time. None of the technologies he was developing proved as cost effective as he hoped, so he went back to the drawing board. Way back. Between the mid-18th and 19th centuries, most factories, ships and trains were powered by steam engines. The technology was simple: a boiler—basically a tank or container with a fire underneath—produced steam by heating water. Building volumes of steam inside the boiler created pressure that could be used to propel movement and conduct work. Until the end of the 19th century, steam engines generated usable power by applying pressure in the boiler against a piston, which triggered a chain reaction when it began moving. The movement would rotate a connected shaft, which could be used to drive mechanical equipment when attached to the wheels of a locomotive or the propeller of a ship, for example. Or it could produce electricity by turning a generator. It was a straightforward process, and steam engines were extremely reliable and long-lasting machines. In fact, it was not at all unusual for a steam engine to work for up to 75 years with infrequent maintenance. Energy access in Africa has changed little in the last 40 years. The downside of steam engines was that they were large, heavy and capital intensive. Over time, as use of fossil fuels and internal combustion engines became more wide- spread, steam engines became less competitive. So when Bielenberg decided to revert to steam as a power source, he knew he had to make improvements. In 2008, using modern materials and enhanced thermodynamics, Bielenberg came up with a small scale, biomass-fueled, steam-powered plant, which transforms wood and agricultural waste into useable energy. He called both the prototype unit and the venture he started to commercialize it Village Industrial Power, or VIP for short. Harnessing biomass as a powerful and efficient source of energy is a potential game changer in poor, off-the-grid communities, where natural matter fuels 75 to 80 percent of total energy use, Bielenberg says. Part of the reason the percentage is so high is because a lot of biomass is burned in traditional open fires, which are an inefficient way of providing heat. Bielenberg argues that to alleviate energy poverty, it makes sense to look at the fuels people are already using to see how to use them more efficiently and to produce modern energy services. “If you can do that, you’re providing people an opportunity to advance economically and increase their standard of living without becoming dependent upon expensive imported fuels. It’s a very powerful paradigm,” he says. The VIP certainly offers a hefty boost of power to that paradigm change, as the “village” part of its name suggests. The machine is meant to provide energy for whole communities or small commercial endeavors, rather than individual households. Intended uses for the VIP include powering agricultural processing, community clinics and hospitals, or microgrids. In fact, all of these applications have been tested. Geographically, the VIP’s target markets include less-developed countries where the technology could stand in for functions that otherwise depend on costly fuel sources like diesel, which costs about US$1 per liter in most parts of Africa. Since the VIP is biomass fueled, the technology is only useful in regions where biomass sources are plentiful—not deserts or regions with few trees or little vegetation. The most ideal areas fall within 10 to 30 degrees of the Equator. In Africa’s remote Sahel region—the strip between the continent’s northern desert and central forest stretching from Sudan to Senegal—rural communities get by with few sources of income and rudimentary infrastructure. “[For energy], people burn wood. Wood and trees are very important to their survival,” Bielenberg explains. For everything that wood cannot fuel, people rely on diesel engines and generators or human muscle power. Diesel machines are expensive in places where income earning opportunities are scarce. Running a small, 2.5-kilowatt diesel generator for a full day can incur about $10 in fuel costs. Thus, people try to minimize fuel use to save cash for inevitable expenses like medicine, clothing and school fees; they do this by relying on their own labor as much as possible. Bielenberg stresses the need for accessible, low-cost types of power, as well as solutions that can provide income-earning opportunities within communities—especially for women. The opportunity to harness biomass as an energy source for under-developed areas came to Bielenberg through 40 years of work in West Africa and a long career in power generation in the United States. In the U.S., he has earned his living representing what he calls a “mission-based company” that makes commercial scale biomass boiler plants. The VIP’s useable energy output takes three forms: mechanical, electrical and heat. Mechanical power can be used to drive machinery or be converted to electrical power through the machine’s generator. The original 7-kW prototype steam engine absorbs 60 percent of the heat from the biomass-fueled fire—about eight percent of which can be used for power or electricity. The latest version of the VIP is a 10-kW machine that can capture 70 percent of the fire’s heat—roughly 10 percent of which can be converted to electricity. Running for eight hours a day, it can produce 80 kW-hours, which is enough power to provide 100 to 200 homes with electricity for low-wattage lighting and basic appliances, like a small refrigerator. It also replaces $32 to $40 in diesel costs each day. The remaining 60 percent of captured energy can be used as heat for applications such as public bathing, cooking, crop processing or drying, or healthcare sterilization. “It sounds like a bad deal that we’re getting more heat than power, but in the applications we’re looking at, [such as] crop processing and healthcare, the demand for heat is actually greater than the demand for electricity or power, so it’s essentially a very good balance,” Bielenberg says. One key advantage of the VIP over other technologies is that its power can be readily dispatched at any time. Photovoltaic solar, for example, requires back-up batteries to run at night or in poor weather conditions. Making steam-powered energy available to resource-scarce communities required Bielenberg and his team to make significant design modifications to their inspirational model. Traditional steam engines had complicated linkages and mechanisms for operating their valves, which added to the machine’s complexity and cost. But the VIP had to be simple in its design, with minimal moving parts, because of the difficulty finding experts to perform maintenance in remote communities. The solution Bielenberg’s team devised was to install self-acting inlet valves. “These are pressurized, operate all by themselves and do exactly what they need to do without requiring any outside mechanism to move them,” he explains. Another important design modification is that VIPs do not require any lubricants for its moving parts. In standard steam engines, operators had to use oil to lubricate the piston and piston rings for the engine to run smoothly. Bielenberg wanted to eliminate lubricants for two reasons: one, because oil would be an added cost, and two, because the lubricating oil for the piston would become mixed with the steam and would have to be filtered out before recycling condensed water back into the boiler—an added complication. If it was not, the oil would burn on the inside of the boiler and reduce its efficiency. As a solution, the VIP team used carbon graphite materials for the sliding surface of the piston and piston seals. Pistons and seals made of this crystalline form of carbon are self-lubricating. This allows the water—a scarce resource in many places—to be easily recycled through the machine. A final improvement of the VIP design is its robust boiler. In hydrostatic tests, where pressurized water is used to assess boiler performance, the machine’s safety factor has proven three times higher than common U.S. boilers. This was the result of Bielenberg’s diligent engineering to ensure the boiler met or exceeded ASME boiler code—a rigorous set of standards that was formed around the advent of commercialized steam power generation. All of these adaptations allow for a more efficient, safe and compact machine. VIPs are still hefty pieces of equipment, however: the completed units weigh about a ton. All VIPs are currently manufactured by hand in New England and shipped to their final destinations ready to operate on arrival. Each unit is built as one piece that can be moved on a pickup truck and bolted onto a concrete pad inside a shed. Once a VIP unit is in place, all the operator has to do is feed it fuel and water to begin using it. There are drawbacks to hand making VIP units so far from their target markets, particularly in terms cost. The machines currently cost about $20,000 to produce. As the company sources lower-cost manufacturing and increases its production volume, the price is expected to drop to about $15,000. By comparison, diesel generator sets that can match the VIP’s electrical power output cost anywhere from $4,000 to $10,000— ongoing diesel fuel costs not included. “So ours is roughly twice as expensive as that to make,” Bielenberg acknowledges. Add in the cost of shipping to ports in Africa, which runs about $2,500 per machine, $100 to $500 for transportation from the port to the final site, and up to $300 for installation and the VIP becomes a pretty expensive piece of equipment for low-income, rural communities to pay upfront. The team acknowledges that there must be financing options for the solution to be viable. But they also expect that when final pricing is settled, the VIP will be cost-competitive with other available technologies. (VIP claims that the machine is already competitive with comparably-sized solar systems.) Bielenberg estimates that if the engine were to run eight to 10 hours a day, the machine would pay for itself in one to two years. In late 2014, VIP began field testing its units to assess which aspects of the technology operate favorably and which need to be improved. Five 7-kW beta prototype units were sent to Africa with grant funding from a USAID 2013 “Powering Agriculture” award: two to Tanzania to power a hospital and a village microgrid, and three to sustainable oil palm plantations in Benin. In Tanzania, the hospital installation is meant to provide electricity for pumping water and heating for laundry, while the village installation is expected to electrify 50 homes and a number of small businesses. In Benin, the installations are meant to displace diesel fuel and firewood to power agricultural processing machinery and supply hot water. The hospital and oil palm VIPs are being tested with fuel from coffee husk (parchment) and oil palm fiber and palm kernel shells respectively, while the village plant is being tested with waste wood cutoffs from plantation-grown eucalyptus trees. In addition to the five test units in Africa, VIP installed two 50-kW units at a state-run nursing home in New Hampshire. These units form part of an integrated off-grid system that is also comprised of hydro-power and diesel generator sets. These units receive steam from a 5 mm Btu Messersmith boiler plant, developed in part by Bielenberg. The New Hampshire installation highlights the technology’s wide-ranging applications and potential use within wealthier communities. Through the field trials, the team hopes to learn more about how the VIP functions as it is fed different types of fuel, as well as how much ash various fuels produce and whether they corrode the transfer surface of the boiler or contribute to “slagging” of the furnace by adhering to its hot surfaces. The trials are also a way to assess the adaptability of the technology to different fuels to determine where it is most suitable for use. Most of the results VIP has collected so far have been anecdotal, but insightful nevertheless. One of the issues the team is tackling, for example, is installing automatic feed controls and battery charging to the machines. Other feedback has revealed that some aspects of the machines work better than initially estimated. One of the most surprising pieces of feedback concerns the machine’s ability to minimize wood as a daily fuel source. Both Bielenberg and Lodge believed farmers and villagers would be most excited about the cost savings of diesel. “But it turns out that vastly reducing the consumption of wood is equally if not more important to them,” Lodge says. This is an important sign for the future of the technology as an effective and sustainable source of energy. It is not hard to imagine how a robust, biomass-fueled power producer could lead to destructive environmental practices, like deforestation, to keep communities heated and lit and to keep pace with economic growth. But to the contrary, Bielenberg believes that the local presence of a VIP could actually encourage reforestation by motivating farmers to sustainably plant trees for fuel use, rather than merely harvest wood for subsistence, he says. The VIP team has not yet published quantitative data on how many kW-hours of electricity the machines can produce per kilogram of biomass material, but they are analyzing these figures for multiple fuel sources. Preliminary tests revealed that when the VIP’s boiler pressure is running between 250 to 300 psi, it requires 25 to 30 kg of air-dried wood per hour to produce 7 kW of power. “The next generation VIP”—which launched in December 2015—“was designed to operate at up to 400 psi. We have observed a great increase in power and efficiency with increased pressure and expect the new units to produce 10 kW with the same fuel consumption,” Bielenberg says. With investment funding from early-stage venture support firm Factor(E) Ventures, the new units—dubbed the V-10—include several improvements, such as a new boiler designed to ASME code, welded pipe connections and stronger internal engine parts to accommodate the increased pressure and power. Market trials of the new units will begin in 2016 in Kenya and Ghana. In the Tanzanian village where the VIP unit is being used to power a microgrid, the process of getting the grid up and running taught the VIP team a great deal about the potential and limitations of their invention. In the village, they found a community that was waiting for the government to connect them to the national electricity grid, even though Tanzania’s grid only reaches 14 percent of its nearly 50 million citizens. (Most of its connected users are in cities.) Because of this, villagers’ willingness to pay for power was limited, even though the government’s pace of connectivity has been slow. Those who recognized that the grid was unlikely to reach them anytime soon were more willing to pay for power, provided they could reduce costs by running the source for longer periods of time to support productive daytime activities. The VIP team thus learned that to make a microgrid system work, those applications have to be available from day one, and there must also be a clear process in place for billing households for the power they use. The costs and planning required to get the technology working to this level can be more than some of VIP’s intended customers can manage. One solution is to help communities develop financing models that are similar to an energy service company or a cooperative, where members would pull together to buy a machine. They also hope to leverage successful community members’ interest in helping their home villages gain access to better resources. “In Africa, people who have gone off and done well are traditionally responsible for helping their villages and families,” Lodge says. Bielenberg has seen first-hand how impactful engagement can be. Last April on a trip to Benin, Bielenberg was speaking with his Malian driver about his work on the VIP. The driver offered to assist with installing the three units in Sakete. He arrived to help unload the machine and manage everyone installing it; he also learned how to service and run it. He told Bielenberg that once he retired, he wanted to have a VIP in his village in Mali. PAEGC accompanied Camco’s partner, Village Industrial Power (VIP), to observe the update of their biomass fueled co-generation units. The team visited three installations at palm oil processing facilities, interviewing palm oil farmers in Benin and meeting with stakeholders in Tanzania. The opportunity to harness biomass as an energy source for under-developed areas came to Bielenberg through 40 years of work in West Africa and a long career in power generation in the United States. The VIP’s useable energy output takes three forms: mechanical, electrical and heat. In rural areas of Benin and Tanzania, access to modern energy services is extremely limited. Village Industrial Power (VIP) Plants are mini-grid systems powered through the combustion of biomass waste produced at local agricultural processing facilities. 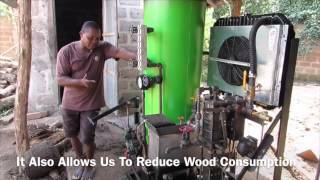 Roland Vign is an Oil Palm producer and an early adopter of the Village Industrial Power (VIP) biomass-powered mini-grid technology. Here Roland explains the benefits the VIP has provided to his community.